The item A spy to die for, Kris DeLake, (electronic resource) represents a specific, individual, material embodiment of a distinct intellectual or artistic creation found in Austin Public Library. Talented enough that she can write her own rules. Budget: Unlimited. Agent: Jack Profile: Main investigator for the loosely federated Rover Assassins. Guided by a strict moral code, fierce loyalty, and a sense of duty. More Than Sparks Will Fly On opposite sides of a high-stakes game, lust lures two spies together in a passionate encounter. Little do they know that the heat of the moment would bind them, turning their worlds upside down. 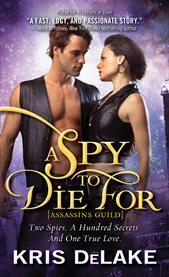 Hunted by deadly assassins, can the pair and their love withstand the onslaught?